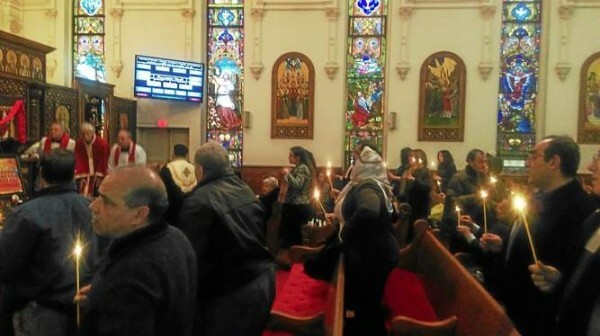 NORRISTOWN >> On March 1, St. George Coptic Orthodox Church of Greater Philadelphia in Norristown honored the 21 Coptic Egyptians massacred by the Islamic State (ISIS) on Feb. 15. 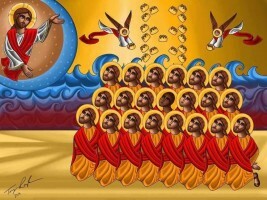 The 21 Coptic Martyrs of Libya were celebrated for their “love for Christ, their courage against the enemy, their patience against oppression, and their victory over death” during a solemn ceremony that inducted them into the Choirs of the Saints. 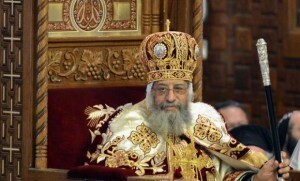 With clergy from other churches in the area joining Bishop Karas, the Papal Exarch for North America and the Rev. Mina Shaheid of St. George in presiding over the traditional funeral service, the pews were filled with parishioners and non-parishioners alike for a somber mid-afternoon, candlelit service.